The office of New York Attorney General Eric Schneiderman says it has evidence that ExxonMobil misled shareholders about how carbon regulations may impact the company's business. In documents filed in court Friday, investigators say they found "secret, internal figures" that indicate the company purposefully understated the financial damage that climate change regulations could have on its business, and potentially did so as far back as 2007. Exxon (XOM) staunchly denied the accusations. In a statement Friday, the company called Schneiderman's claims "inaccurate and irresponsible" and insisted Exxon's estimates have "accurately described" carbon costs to investors. "The documents produced to the Attorney General make this fact unmistakably clear," the statement reads. Exxon says it plans to "respond fully" in an upcoming court filing. The State Department declined comment and referred questions to Exxon. Tillerson has been a big part of Schneiderman's probe into the oil and gas company since it began in 2015. One of its bombshell revelations was that Tillerson used a fake email under the name "Wayne Tracker," to discuss climate change internally. A new filing posted Friday suggests that the new Exxon chief, Darren Woods, also has an alias corporate email account. He allegedly goes by the name of J.E. Gray. Exxon confirmed the account was set up for Woods, but it was intended to "manage a high volume of messages" and has never been used. The filing also claims that Exxon has refused to hand over "untold numbers" of key documents to investigators, including emails from top executives. Exxon has denied past accusations that it hasn't adequately complied with subpoenas, saying it's forked over "millions" of pages of documents. The company has a complex history with climate change. Exxon admitted publicly in 2007 that climate change poses a risk. 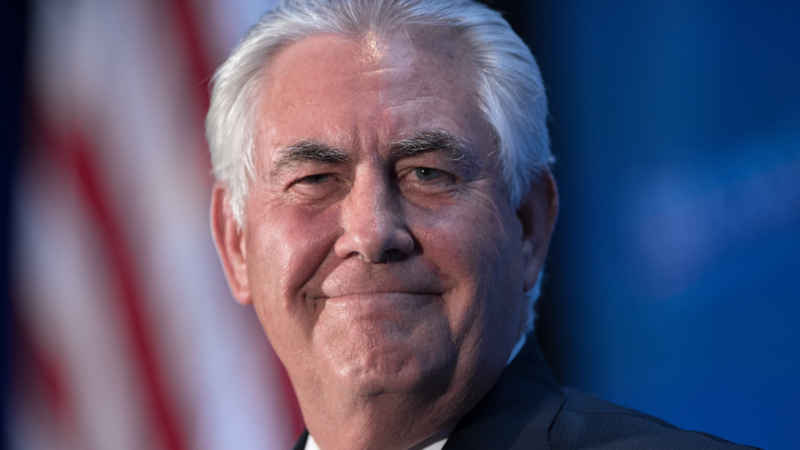 And Exxon has publicly pressured Tillerson's new boss, President Trump, to keep the U.S. in the Paris Climate Agreement, which seeks to implement stricter carbon regulations globally. At its shareholder meeting Wednesday, Exxon insisted it's "well positioned" to survive stricter carbon regulations. Yet, Schneiderman alleges that while Exxon has taken this stance publicly, the company has actively worked to deceive its investors on the issue. Exxon shareholders have questions as well. In a rare defeat for a major company, over 63% of its shareholders called on Exxon Wednesday to release more information about how carbon regulations will impact its business going forward -- particularly how it would be "affected by worldwide efforts to adopt the goals of the Paris Agreement." Another mixed signal came from Tillerson Friday. Though he previously advised Trump not to withdraw, Tillerson defended Trump's decision to ditch the Paris pact. He appeared to minimize the significance of pulling out of the accord, saying he believes the U.S. will keep reducing its emissions with or without the agreement.